Typically the candidate will be suffering from Sensorineural hearing loss but will still have their hearing nerve intact and functional. Unaided hearing levels of worse than 80 dB on audiograms together with unaided AB (a word recognition hearing test ) scores of less than 50% are typical reference points for adults and post lingual adolescents and children. Born deaf children and children who are deafened by meningitis are automatically considered for implantation subject to any other factors. 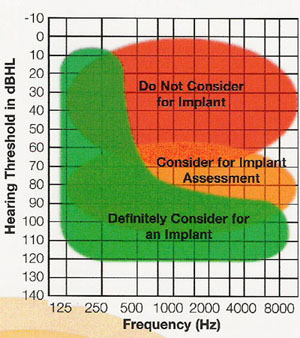 The audiogram chart shown here illustrates the broad indications of potential candidature for a cochlear implant. This shows the unaided hearing level boundaries involved. If you became profoundly deaf after you developed spoken language skills, then a cochlear implant might be suitable, but this is not the case for everyone. If you are an adult who has been deaf from birth, or before learning to speak or understand language, a cochlear implant may not suit you. This is because it is better to have some memory of sound in order to make sense of the signals provided by the implant. However, some adults who were born deaf or who became deaf at a young age can gain considerable benefit from a cochlear implant, provided they have tried hearing aids in the past and are keen to hear. If you get sufficient benefit from modern high-powered hearing aids with well-fitting moulds and you can follow speech quite well without lip-reading, then you are unlikely to be considered for a cochlear implant. You may get more benefit from your implant if you receive it soon after becoming deaf. However, your age is not important when your doctors are deciding whether an implant will be suitable for you.